A call for peace, flower power and women’s rights. Kicking off Paris Fashion Week with a bang, Dior turned back time half a century to stage a 1968 protest down its Fall 2018 runway. Since her appointment as the first female artistic director at the French fashion house, Maria Grazia Chiuri has utilized Dior’s runways and collections to empower women. Today’s show was no different as she channeled the resistance culture amongst students of the 1960s to advocate for women’s equality. “Take a look back to a time a half-century ago when revolutionary thoughts and actions were placing the power and energy of youth center stage and influencing generations to come. 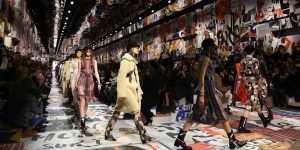 For Autumn-Winter 2018-2019, Maria Grazia Chiuri tapped into this anniversary, reinventing and reimagining the legacy of those heady times,” Dior wrote, sharing the inspiration behind its show on Instagram. The exterior of the show space, which was held at Musée Rodin, was covered in a collage of protest signs reading things like Hillary Clinton’s famous 1995 quote, “Women’s Rights Are Human Rights.” Inside, the runway set echoed the same sentiment and was wallpapered with a collage of protest signs, feminist slogans and fashion magazine cutouts all from 1968 (including a few vintage Harper’s BAZAAR magazine cutouts too). As for the collection, the pieces echoed the 1960s resistance just as effectively as the walls. 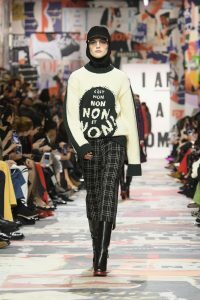 The runway opened with a thick knit sweater reading “C’est Non Non Non et Non!” (which translates to “It’s no no no and no!”) while another sweater featured an oversized peace sign. An array of ’60s-inspired patchwork pieces hit the runway in the form of mini skirts, boots and dresses. But there was also a dose of flower power-infused dresses, a standout shag coat, paisley-like prints and colorful lensed sunglasses. 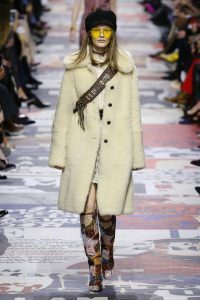 Following a season where many designers at New York Fashion Week surprisingly opted not to delve into politics, Maria Grazia Chiuri went all-in to commence Paris Fashion Week, making her message for Dior’s Fall 2018 show loud and clear. 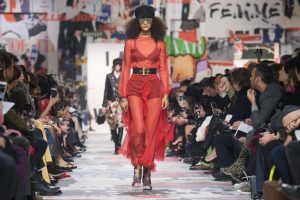 While the designer first kicked off her journey at Dior with those “We Should All Be Feminist” slogan tees that took over the street style scene, she’s proven that tapping into the feminist movement isn’t just a one-season “trend” for the brand. And that’s a good thing. Are tiny handbags about to become an even bigger trend? Jacquemus takes the appeal of a micro bag to a whole new level. Sisters-in-law and the fashion duo behind Veronica Beard on championing women through clothes and channelling everyday cool. The über-cool Japanese DJ, designer; and stylist, shares her day.